I admire a can-do attitude. I particularly admire people who try something unique to fund something that they believe in. You may recall that last week, I reviewed Lohio's beautiful new album Family Tree. It made me very curious about this band, so I was pleased to receive some additional information from their record label the other day, including a couple of live sessions they did recently with Draw Us Lines. 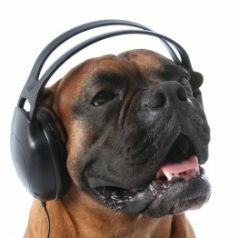 If the gorgeous music and pretty people isn't enough to win your heart, that big old lazy dog is sure to. And here's the really cool part. Lohio has started a Kickstarter project in an attempt to raise $4,000 to produce a music video. Kickstarter is an innovative method that musicians can use to raise funds through direct interaction and exchange with music lovers. Do check out the pledge video that Greg and Liz from Lohio have made. They are so cute and funny, I just want to throw buckets of money at them. Too bad that house concert reward is limited to the USA, or I would be sorely tempted. 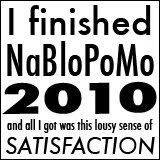 I have now completed my NaBloPoMo commitment. Thirty posts in thirty days. You know what? It was very satisfying. Thanks so much for reading. You are why I do this, you know. 1. That dog? OMG, want! Yay! I backed 'em. Had to...they're hometown kids! Me too, Lesley. I want a big old lazy dog to go with my big old lazy cat. Nicely done, Beckeye! You're a mensch. And I'll bet Santa saw that. And now I have finished my leave a comment pledge. It has been a lot of fun stopping by each day. I can't believe December 1 arrive in 40 minutes! I think you deserve one of these badges too, Toccata. If I knew how to do that sort of thing, I would make one for you. I can't tell you how much I appreciate your stalwart commenting. Hearing from you every day was my favourite part of NaBloPoMo. Congrats on completing NaBloPoMo - what a huge undertaking! Satisfaction is its own reward. It really wasn't that hard, Kathy! Mind you I live on the internet anyway, so blasting out a few paragraphs every day is easy peasy.